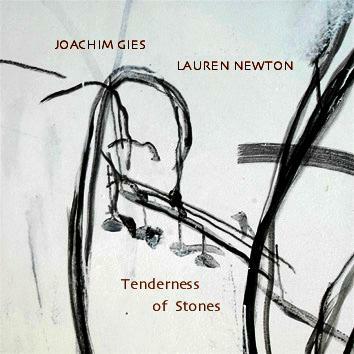 Joachim Gies - saxophones and electronics, Lauren Newton - voice. Stuart Broomer writes in his notes: "Tendersness of Stones is the rarest of works, a piece that bridges preconceived large structures and spontaneous detail; that blurs lines between creation, translation and interpretation; that seems first to displace the notion of form (of word, sound, line) only to ultimately extend it. It is also a rare work of genuine partnership between two musicians whose interests extend far into the word and the possibilities of composition and improvisation. "... some just beyond the range of speech, on one occassion the kind of incoherent mutterings one sometimes catches on the street: notice the play of incoherence in "Vanishing Point // Fluchtpunkte," in which there is both Newton's brilliant mimicry of a tape or CD glitch and strange street-babble."